This website will give all the Doctors, therapists, sculptors and non-professionals that are interested, an initial insight of the sculptor courses developed and conducted by myself Rudolf Söllner. This firstly presents “photographic material” under the headings of “Stone sculptors” and “Course impressions”. These will be used variously in the concept and show the results of various individuals. 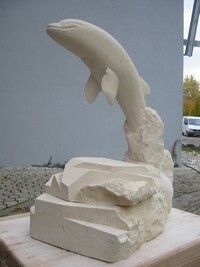 In the published text material “Therapy Courses” you will find a few fundamental ideas on the specific subject of a sculptor course using natural stone material. These run under different aspects (prompting creativity, therapy, self-awareness etc.) and are regularly refined and elaborated on.